BRAKE Materials & PARTS accepts Visa, Mastercard, Discover, and American Express. When placing your order be sure to indicate the card holders name, the credit card billing address, shipping address, home phone, phone where you can be reached during the day, credit card number, and expiration date - and your name if different from the person charging the order. All orders paid by personal check are held pending bank clearance. Only first-party checks will be accepted. BRAKE Materials & PARTS will not accept out-of-state checks. Customers must pay the appropriate current sales tax. Should you need to return a part for a refund, exchange or credit please contact our sales department for authorization and instructions. BRAKE Materials & PARTS will not accept returned goods without prior authorization. Freight charges are not refundable and customers will pay freight on all return orders. Returns could be subject to a restocking fee of up to 50%. BRAKE Materials & PARTS warranties to the original purchaser of its products that those products will be free of defective materials and workmanship. This does not include defects caused by neglect, improper installation, maintenance, or service. Our obligation under this warranty is limited to one year from date of purchase or fifteen thousand miles after installation, whichever comes first. New items carry original manufacturers warranty. Any purchased or component products we use in the manufacture and assembly of a finished product shall carry its original manufacturers warranty. Our obligation at our discretion will be limited to the repair or exchange of any part or parts which may prove defective. This warranty shall not apply to any product or component thereof which has been repaired or altered. Warranty does not include labor charges, or incidental or consequential damages. Warranty does not cover damages caused by incorrect installation and/or abuse caused by use with improper fluids, mishandling, accidents or normal wear. Product should be used with fluid originally approved for the application - usually DOT 3 and DOT4, but not DOT5 (silicone fluid). Warranty is voided after product is used for racing or other timed event. Product Liability By placing an order with BRAKE Materials & PARTS, the customer accepts that BRAKE Materials & PARTS shall not be held liable for any and all damages, injury, loss and other claims, resulting from the inability, use or misuse of the product. Buyer or user accepts liability of all kinds associated with the use of all products. Working on automobiles is inherently dangerous. BRAKE Materials & PARTS is not liable for injury or damage due to incorrect installation or use of their products. All products are sold with understanding that the safe and proper installation and use of the products is the customer's responsibility. Follow factory workshop manual procedures and instructions, but use current shop safety standards and common sense. Some tasks will require professional advice or services which BRAKE Materials & PARTS cannot provide. Most of our shipments are by United Parcel Service ground delivery. UPS requires a street address (UPS will not deliver to a P.O. Box). UPS tries to deliver a package three times before returning the order. If no one is available to accept the merchandise, a notice will be left with further instructions. Please contact UPS immediately so your shipment will be delivered to you without delay. U.S. Mail and FedEx used upon request only. For “OS” (oversized) items that can be shipped via UPS, oversize rates apply. Oversized items are charged in accordance with the UPS Dimensional Weight Formula (the average weight plus size and girth). Many products are oversized. We reserve the right to charge an oversize fee on any order which contains a product that is oversized. BRAKE Materials & PARTS offers UPS 2nd and 3rd Day Air Delivery which is available in the Continental U.S., Hawaii, and Alaska. The cost of 2nd day delivery is greater than normal UPS ground delivery and is based on UPS Dimensional Weight Formula. UPS will deliver the package(s) within 2 or 3 working days from the time the order is shipped (excluding Saturdays, Sundays and holidays). BRAKE Materials & PARTS offers UPS next day delivery with same qualifications as UPS 2nd and 3rd Day Air Delivery. The cost is approximately 1/2 times greater than 2nd day delivery. All Alaskan and Hawaiian orders are shipped via UPS 2nd Day Air Delivery whenever possible. UPS rates depend on the items being ordered. Parcel post is the only means of shipping to an APO or FPO address. Due to size restrictions the maximum shipping box can be no larger than 72” width and girth combined. All military personnel must write or call to determine what size box will be used for the shipment. All orders that exceed these limitations will be shipped in accordance with customer approval. Due to various rate differences and depending on what items are being ordered, your freight fees will vary. It is important that you contact the BRAKE Materials & PARTS sales department for instructions regarding all foreign orders. Please enclose the items you intend to order so we may calculate the best – most efficient and inexpensive way – to ship your order. You will be solely responsible for the customs, duties, additional taxes and requirements. Always check the contents of your shipment in the presence of the person delivering the merchandise. Should any damage occur, immediately notify UPS so that all the steps necessary will be taken to insure a prompt replacement of any damaged goods. BRAKE Materials & PARTS is not responsible if notification is not given within 5 days of receipt. Please contact our sales department if you have an issue. BRAKE Materials & PARTS is committed to maintaining the privacy of our visitors and customers. The registration information is intended for the soul use of BRAKE Materials & PARTS. We do not give out any information. The privacy, confidence, and trust of individuals who visit the BRAKE Material & PARTS website are important to us. No personal information is collected at this site unless it is provided voluntarily by an individual while participating in an activity that asks for the information. The following paragraphs disclose the information gathering and usage practices for the web site. BRAKE Material & PARTS only collects the personal information that is necessary to provide the information or services requested by an individual. "Personal information" refers to any information relating to an identified or identifiable individual who is the subject of the information. This is the same information that an individual might provide when visiting our office and it includes such items as an individual's name, address, or phone number. We also collect statistical information that helps us understand how people are using the web site so we can continually improve our services. The information collected is not associated with any specific individual and no attempt is made to profile individuals who browse the web site. BRAKE Material & PARTS uses the collected information to respond appropriately to requests. This may be to respond directly to you or to improve the web site. E-mail or other information requests sent to BRAKE Material & PARTS may be retained for future use. BRAKE Material & PARTS is committed to the security of the information that is either available from or collected by this web site. BRAKE Material & PARTS has taken multiple steps to safeguard the integrity of its telecommunications and computing infrastructure, including but not limited to, authentication, monitoring, auditing, and encryption. BRAKE Material & PARTS is not responsible for the privacy practices or the content contained on links to other sites. BRAKE Material & PARTS will not knowingly collect information about persons under the age of 13 without prior parental consent. If you are under the age of 13 you must ask a parent or guardian for help. 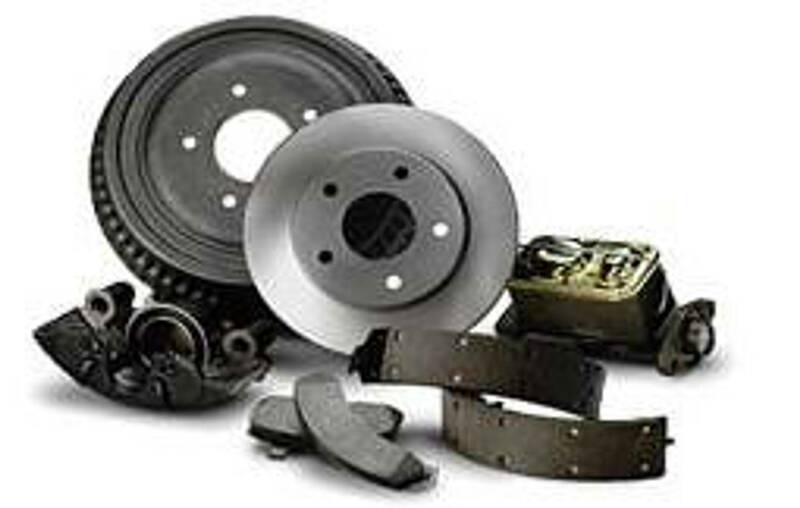 BRAKE Material & PARTS site is provided on an "AS IS," "as available" basis. Neither BRAKE Material & PARTS nor its affiliates, subsidiaries, or designees nor each of their respective officers, directors, employees, agents, third-party content providers, designers, contractors, distributors, merchants, sponsors, licensors or the like (collectively, "associates") warrant that use of BRAKE Material & PARTS site will be uninterrupted or error-free. Neither BRAKE Material & PARTS nor its associates warrant the accuracy, integrity or completeness of the content provided on BRAKE Material & PARTS site or the products or services offered for sale on BRAKE Material & PARTS site. Further, BRAKE Material & PARTS makes no representation that content provided on BRAKE Material & PARTS site is applicable or appropriate for use in locations outside of the United States. BRAKE Material & PARTS specifically disclaims warranties of any kind, either expressed or implied, including but not limited to warranties of title or implied warranties of merchantability or fitness for a particular purpose. No oral advice or written information given by BRAKE Material & PARTS, nor its associates, shall create a warranty. You expressly agree that use of BRAKE Material & PARTS site is at your sole risk. Under no circumstances shall BRAKE Material & PARTS or its associates be liable for any direct, indirect, incidental, special or consequential damages that result from the use of or inability to use BRAKE Material & PARTS site, including but not limited to reliance by a user on any information obtained at BRAKE Material & PARTS site, or that result from mistakes, omissions, interruptions, deletion of files or email, errors, defects, viruses, delays in operation or transmission, or any failure of performance, whether or not resulting from acts of God, communications failure, theft, destruction or unauthorized access to BRAKE Material & PARTS records, programs or services. The foregoing Limitation of Liability shall apply whether in an action of contract, negligence or other tortuous action, even if an authorized representative of BRAKE Material & PARTS has been advised of or should have knowledge of the possibility of such damages. User hereby acknowledges that this paragraph shall apply to all content, merchandise and services available through BRAKE Material & PARTS site. Because some states do not allow the exclusion or Limitation of Liability for consequential or incidental damages, in such states liability is limited to the fullest extent permitted by law. Errors will be corrected where discovered, and BRAKE Material & PARTS reserves the right to revoke any stated offer and to correct any errors, inaccuracies or omissions. While BRAKE Material & PARTS takes steps to ensure the accuracy and completeness of product and third-party services provided, please refer to the originator of information for details, for example the manufacturer and/or web site for complete details.